Bacon = awesome. Barbecue = awesome. So bacon barbecue should equal double awesome, right? Logic isn't exact in Pigchaser Bacon Barbecue sauce when good flavor is brought down a notch by soft and chewy bacon bits. 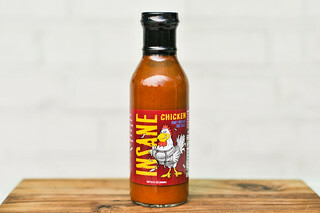 Pigchaser, a line of five barbecue sauces created by Ron Slawek in 2007, has represented ups and downs so far. First I thought Pineapple/Mango delivered on fruit, but not much in the way of barbecue flavor. Then the Habanero wowed me with its great heat and balance of sweet and tangy. What's most distinct about this is that Ron is actually tailoring each sauce to its unique defining characteristic. 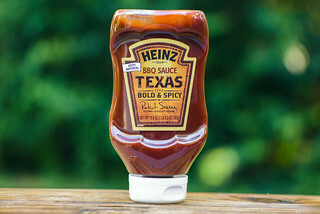 So often sauce companies take a lazy approach and do things like throwing additional pepper into their original sauce and calling it "hot," leaving only minor differences between recipes. The Pigchaser approach of building a unique sauce around a base ingredient makes things much more interesting, and has kept me wanting to try every variation in the line with more enthusiasm than usual. 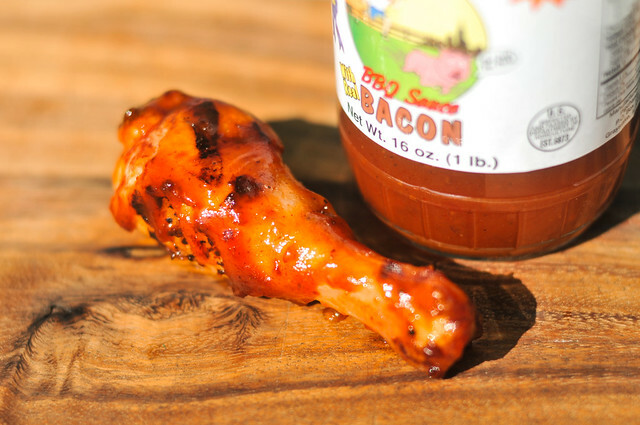 In that mindset, I tackled this Bacon BBQ Sauce, which combines two things I love so much. Pigchaser Bacon starts with a sweet, tangy, and fruity aroma. The distinct smell of honey mixes equally with vinegar to form the base, while a less intense pineapple serves as an undertone. The presence of bacon is known mainly from the sauce's smokiness. There are faint notes of onion in there as well. This rusty orange sauce weighs in between medium and thick. It fills a spoon, then when released, first falls in a one big glob, followed by a few smaller ones, with a thick layer of sauce left clinging. It's also incredibly textured—large and small chunks of bacon and veggies are peppered throughout, as well as a fair amount of visible spices. First taste is of an overly sweetened ketchup. Honey is the most dominant flavor, with tomato close behind. The tang of vinegar quickly comes in and balances out the sweetness, and as the sauce settles on the tongue, tastes of pineapple, onion, and garlic make an appearance. The bacon bits are large and plentiful, giving the sauce a meaty and smoky flavor, as well as a chunky texture. The bacon is not crisp, but soft, making this the first sauce I've ever had to chew. On the grill, the sauce clung to the chicken leg very well and baked in over indirect heat. There was light caramelization over direct heat, as well as some burn off. The thick sauce created one sweet and sticky piece of poultry. Sugar and fruit were the defining flavors, with the tang of vinegar slightly diminished, and the more nuanced elements—like onion and garlic—struggling to be known. Bacon only came into play when I hit a bacon bit, but those were few and far between. Bacon = awesome. Barbecue = awesome. So bacon barbecue sauce should equal double awesome, right? That's what I would think, but they may not be a match made in heaven. 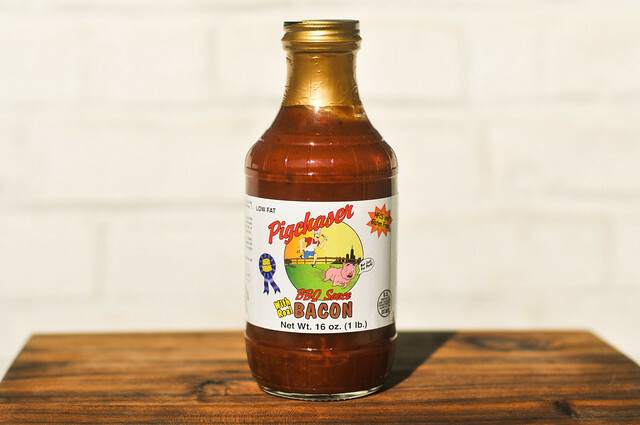 Pigchaser bacon has a nice, balanced sweet tomato barbecue sauce base, and while the bacon adds a decent smokiness without the use of acrid liquid smoke, the soft and chewy pieces of bacon were not pleasing in the way crisp, crunchy bacon bits are. The flavor wasn't bad though, and the idea is commendable. 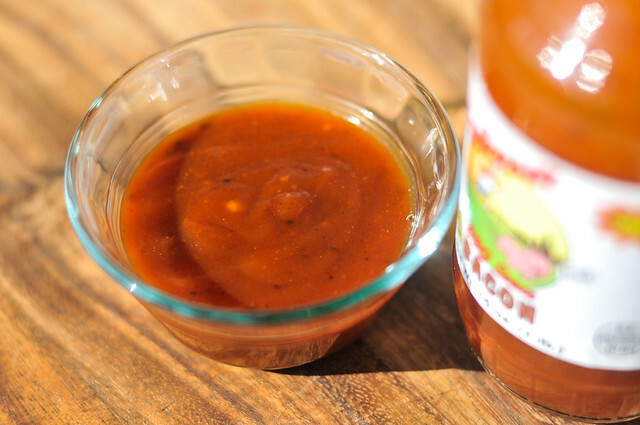 If you really love bacon-anything, it's worth giving this sauce a try. If you want to get the most out of the bacon flavor, it's best to use it as a condiment since there were fewer bacon pieces to be had after being cooked due to them being more spread out and some falling off. 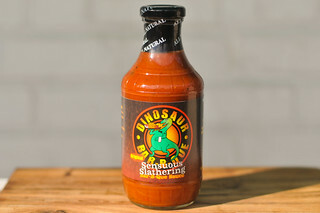 I think spread on top of a juicy burger would be the ideal use for this sauce. Now that makes three Pigchaser sauces I've reviewed, each with their own unique flavors and levels of successfulness. This pattern only makes more excited to see what the last two I have to try will bring. I notice that adding bacon to things in general has a mixed success rate. It's great on burgers, salads, etc but when you start adding it to mayo, bbq sauce, etc, it's not a slam dunk. You've never had a BLT? It has mayo. With all the other bbq sauce recipes out there why not bacon? It may not be a slam-dunk to you but it's my biggest seller.